The spinal cord is a column of nerve tissue protected by a bony tube in the spinal column. 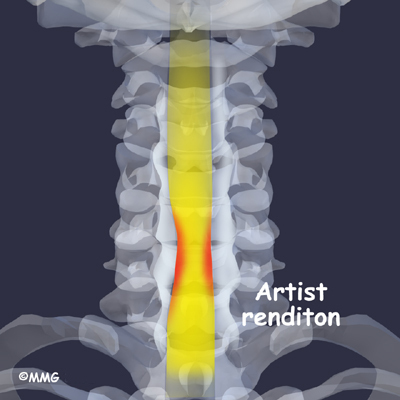 Conditions that narrow the space in this tube put the spinal cord at risk of getting squeezed. 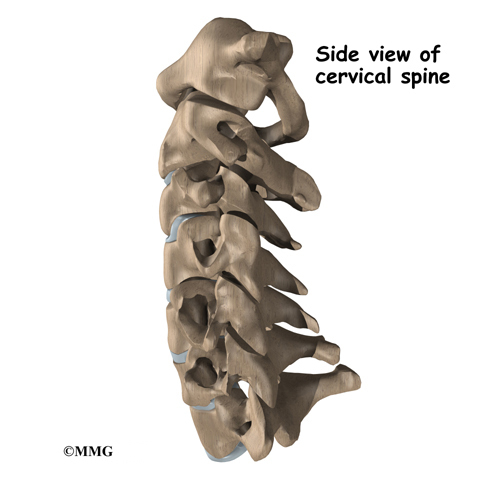 This narrowing in the spinal column of the neck is called cervical spinal stenosis, or cervical stenosis. Pressure against the spinal cord as a result of spinal stenosis causes myelopathy, a condition that demands medical attention. Myelopathy can cause problems with the bowels and bladder, change the way you walk, and affect your ability to use your fingers and hands. This bony ring is formed by two sets of bones. One set, the pedicle bones, attaches to the back of each vertebral body. On the other end, each pedicle bone connects with a lamina bone. 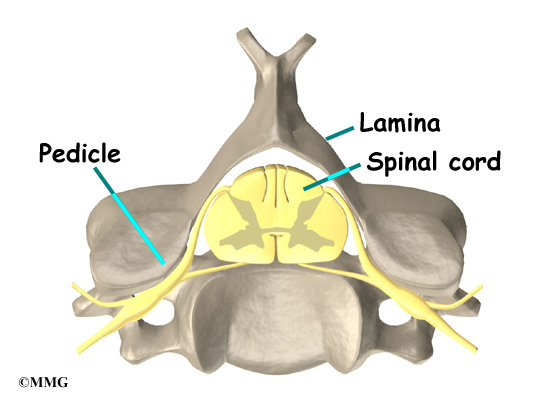 The lamina bones form a protective roof over the back of the spinal cord. When the vertebra bones are stacked on top of each other, the bony rings forms a long bony tube that surrounds and protects the spinal cord as it passes through the spine. An intervertebral disc fits between each vertebral body and provides a space between the spine bones. The disc works like a shock absorber. It protects the spine against the daily pull of gravity. It also protects the spine during activities that put strong force on the spine, such as jumping, running, and lifting. The bony spinal canal normally has more than enough room for the spinal cord. Typically, the canal is 17 to 18 millimeters around, slightly less than the size of a penny. Spinal stenosis occurs when the canal narrows to 13 millimeters or less. When the size drops to 10 millimeters, severe symptoms of myelopathy occur. Myelopathy is a term for any condition that affects the spinal cord. The symptoms of myelopathy result from pressure against the spinal cord and reduced blood supply in the spinal cord as a result of the pressure. Some people are born with a spinal canal that is narrower than normal. This is called congenital stenosis. They may not feel problems early in life, but having a narrow canal to begin with places them at risk for stenosis. Even a minor neck injury can set them up to have pressure against the spinal cord. People born with a narrow spinal canal often have problems later in life, because the canal tends to become narrower due to the affects of aging. 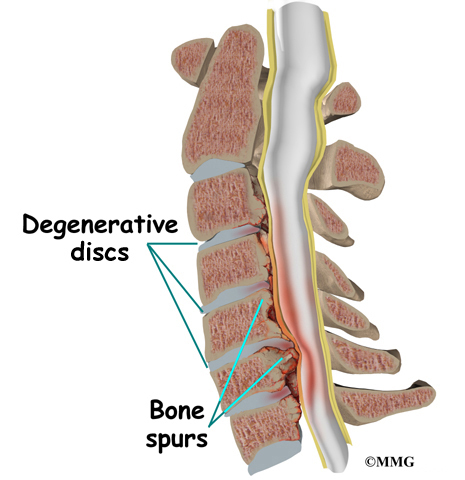 These degenerative changes often involve the formation of bone spurs (small bony projections) that point into the spinal canal and put pressure on the spinal cord. Degeneration is the most common cause of spinal stenosis. Wear and tear on the spine from aging and from repeated stress and strain can cause many problems in the cervical spine. The intervertebral disc can begin to collapse, shrinking the space between vertebrae. Bone spurs may form that protrude into the spinal canal and reduce the space available to the spinal cord. The ligaments that hold the vertebrae together may become thicker and can also push into the spinal canal. All of these conditions narrow the spinal canal. Spinal instability can cause spinal stenosis. Spinal instability means there is extra movement among the bones of the spine. Instability in the cervical spine can happen if the supporting ligaments have been stretched or torn from a severe injury to the head or neck. People with diseases that loosen their connective tissues may also have spinal instability. For example, rheumatoid arthritis can cause the ligaments in the upper bones of the neck to loosen, allowing the topmost neck bones to shift and close off the spinal canal. Whatever the cause, extra movement in the bones of the spine can lead to spinal stenosis and myelopathy. Spinal stenosis can occur when a disc in the neck herniates. Normally, the shock-absorbing disc is able to handle the downward pressure of gravity and the strain from daily activities. 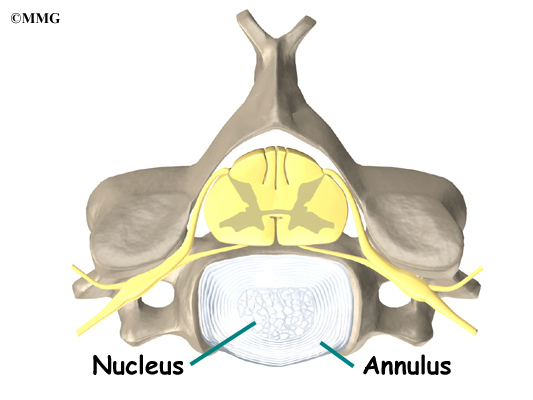 However, if the pressure on the disc is too strong, such as from a blow to the head or neck, the nucleus inside the disc may rupture through the outer annulus and squeeze out of the disc. 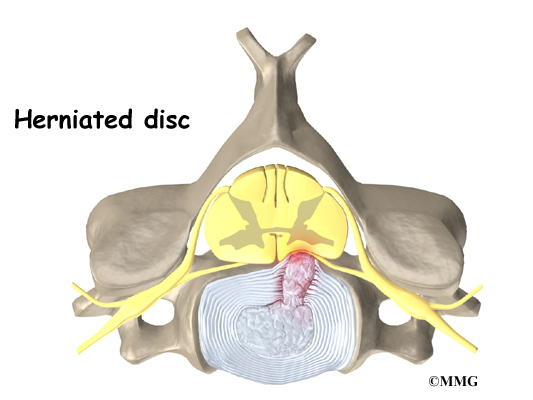 This is called a disc herniation. If an intervertebral disc herniates straight backward, it can press against the spinal cord and cause symptoms of spinal stenosis. The changes that happen with degeneration and disc herniation can choke off the blood supply that goes to the spinal cord. The sections of the spinal cord that don't get blood have less oxygen and don't function normally, leading to symptoms of myelopathy. What does cervical stenosis feel like? 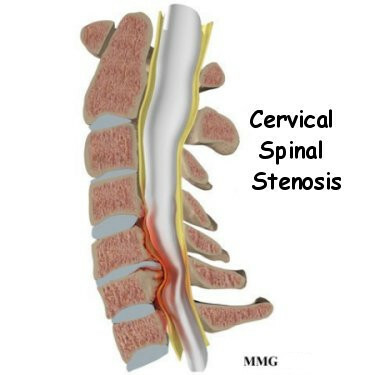 Cervical stenosis usually develops slowly over a long period of time. This is partly because degeneration in later life is the main cause of spinal stenosis. 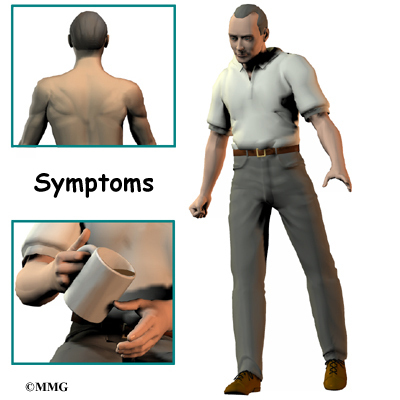 Symptoms rarely appear all at once when degeneration is causing the problems. A severe injury or a herniated disc may cause symptoms to come on immediately. The first sign to appear in some patients is a change in the way they walk. They don't realize this problem is coming from their neck. But pressure on the spinal cord in the neck can affect the nerves and muscles in the legs, leading to changes in the way they walk. Eventually their walking pattern gets jerky and they lose muscle power in the legs. This is called spasticity. Most patients also have problems in their hands. The main complaint is that their hands start to feel numb. Others feel clumsy when doing fine motor activities like writing or typing. The ability to grip and let go of items becomes difficult because the muscles along the inside edge of the palm and fingers weaken. Shoulder weakness also develops in many patients. This happens most often when the spinal cord is compressed in the upper part of the neck. Most affected are the shoulder blade muscles and the deltoid muscle, which covers the top and outside of the shoulder. These muscles weaken and begin to show signs of wasting (atrophy) from not getting nerve input. The area where the spinal cord is compressed in patients with stenosis is very close to the nerves that go to the arm and hand. The problem that compresses the spinal cord in the neck may also affect the nerves where they leave the spinal column. Nerve pressure can cause pain to radiate from the neck to the shoulder, upper back, or even down one or both arms. It can also cause numbness on the skin of the arm or hand and weakness in the muscles supplied by the nerve. Pressure against the spinal cord also creates problems with the bowels and bladder. Mild spinal cord pressure makes you feel like you have to urinate more often. But it also makes it difficult to get urine to flow (urinary hesitancy). Moderate disturbances cause people to have a weak flow of urine, making them dribble urine. They also have to strain during bowel movements. In severe cases, people aren't able to voluntarily control their bladder or bowels. This is called incontinence. How will my doctor identify the condition? Diagnosis begins with a complete history and physical exam. Your doctor will ask questions about your symptoms and how your problem is affecting your daily activities. This will include questions about pain, feelings of numbness or weakness, changes in bowel or bladder function, and whether you've noticed any changes in the way you walk. Then the doctor does a physical examination to see which neck movements cause pain or other symptoms. Your skin sensation, muscle strength, and reflexes are tested. Your doctor will also watch you walk to see if there are any subtle changes in your walking pattern. X-rays are used to look for the cause of pressure against the spinal cord. The images can show if degeneration has caused the space between the vertebrae to collapse and may show if a bone spur is pressing against the spinal cord. If more information is needed, your doctor may order a magnetic resonance imaging (MRI) scan. 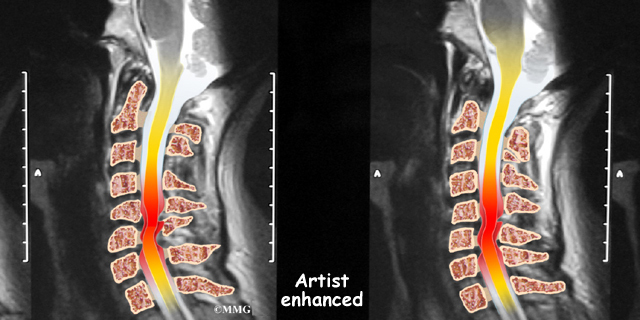 The MRI machine uses magnetic waves rather than X-rays to show the soft tissues of the body. This test gives a clear picture of the spinal cord and can show where it is being squeezed. This machine creates pictures that look like slices of the area your doctor is interested in. The test does not require any special dye or a needle. A computed tomography (CT) scan may also be ordered. The CT scan is a detailed X-ray that lets doctors see slices of bone tissue. The image can show if bone spurs are protruding into the spinal column and taking up space around the spinal cord. Your doctor may recommend electrical tests of the nerves that go to your arm and hand. An electromyography (EMG) test is used to check if the motor pathway in a nerve is working correctly. Doctors may also order a somatosensory evoked potential (SSEP) test to locate more precisely where the spinal cord is getting squeezed. The SSEP is used to measure whether a nerve is able to get and send sensory information such as pain, temperature, and touch. The function of a nerve may be recorded with an electrode placed over the skin or with a needle that is inserted into the nerve or sensory center of the brain. Spinal myelopathy is a serious condition. If your condition is causing significant problems or is rapidly getting worse, your doctor may not begin with nonsurgical treatments and instead recommend surgery immediately. If the symptoms are mild, nonsurgical treatment may be tried initially to see if the symptoms improve. At first, doctors may suggest immobilizing the neck. Keeping the neck still for a short time can calm inflammation and pain. Patients are instructed to restrict their daily activities by avoiding heavy and repeated motions of the neck, arms, and upper body. Doctors may also prescribe a soft neck collar. The collar is a padded ring that wraps around the neck and is held in place by a Velcro strap. Patients wear the collar during waking hours for up to three months. Then they slowly begin to taper the amount of time they wear it each day. If the condition is very mild, some doctors have their patients work with a physical therapist. At first, treatments are used to ease pain and inflammation. Electrical stimulation treatments can help calm muscle spasm and pain. 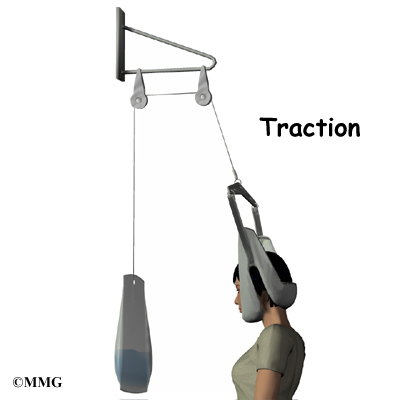 Traction is a way to gently stretch the joints and muscles of the neck. It can be done using a machine with a special head halter, or the therapist can apply the traction pull by hand. 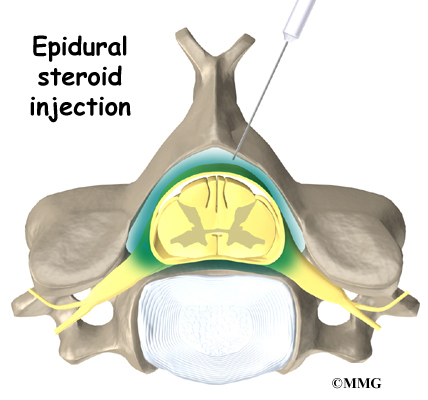 Some patients are given an epidural steroid injection (ESI). The injection is given in a part of the spinal canal called the epidural space. This is the area between the dura (the material that covers the spinal cord) and the spinal column. It is thought that injecting steroid medication into this space fights inflammation around the nerves and discs. This can reduce the swelling and give the spinal cord more room. The lamina is the covering layer of the bony ring of the spinal canal. It forms a roof-like structure over the back of the spinal cord. 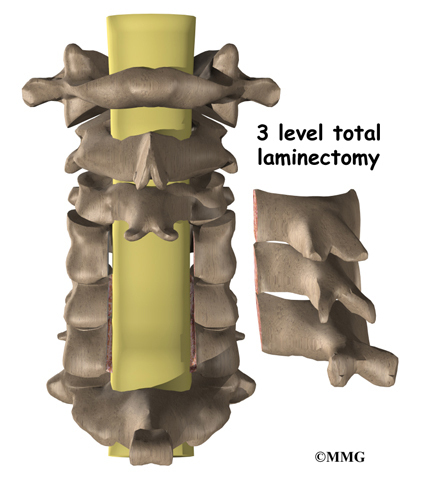 When bone spurs or disc contents have pushed into the spinal canal, a laminectomy is done to take off the lamina bone in order to release pressure on the spinal cord. Some surgeons completely remove the entire lamina bone, called total laminectomy. Others prefer to keep the lamina in place by forming a hinge on one edge of the bone. This hinge is formed by cutting partially through the lamina on one side. A second cut is made all the way through the lamina on the other side. This edge is then lifted away from the spinal cord, and the other edge acts like a hinge. 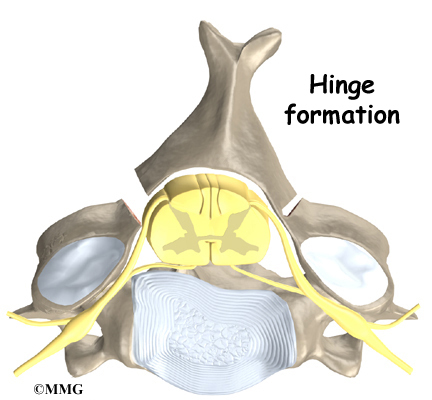 The hinged side eventually forms a bone union, which holds the opposite side open and keeps pressure off the spinal cord. A fusion surgery joins two or more bones into one solid bone. Fusion of the neck bones is most often done through the front of the neck. The surgeon takes out the intervertebral disc (discectomy) between two vertebrae. A layer of bone is shaved off the flat surfaces of the two vertebrae to be fused. This causes the surfaces to bleed and stimulates the bone to heal. (This is similar to the way two sides of a fractured bone begin to heal.) 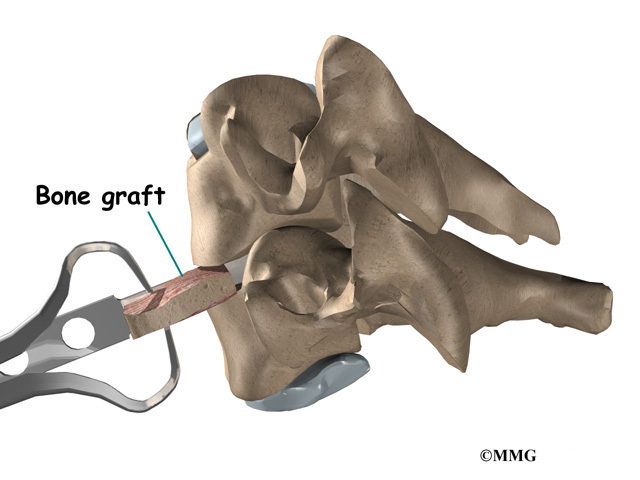 A section of bone is grafted from the top part of the pelvis bone and inserted into the space where the disc was taken out. This separates the two vertebra bones, taking pressure off the spinal cord. As the bone graft heals in place, the vertebral bones fuse together into one solid bone. A corpectomy relieves pressure over a large part of the spinal cord. In this procedure, the surgeon takes off the front part of the spinal column and removes several vertebral bodies. The spaces are then filled with bone graft material. Metal plates and screws are generally used to hold the spine in place while it heals. 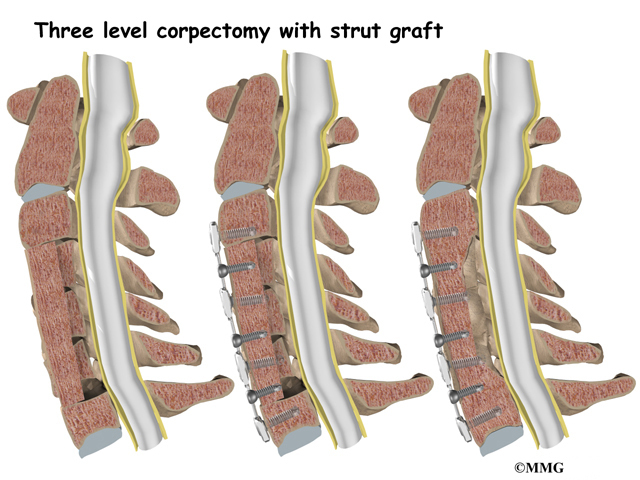 A corpectomy is used in cases of severe spinal stenosis. Patients with mild symptoms of cervical myelopathy may try nonsurgical treatment for three to six months. After wearing a neck brace for up to three months, patients will slowly resume routine activities. They usually visit their doctor every four to six weeks to check their progress. Some patients leave the hospital shortly after surgery, but some surgeries require patients to stay in the hospital for a few days. A physical therapist may see the patient for treatment in the hospital room after surgery. Therapy sessions are designed to help patients learn to move and begin doing routine activities without putting extra strain on the neck. During recovery from surgery, a patient may be placed in a halo vest or rigid neck brace. These braces are used to restrict the motion in the neck to allow the fusion to heal. Patients generally need to be extremely cautious about overdoing activities in the first few weeks to months after surgery. Most patients spend time rehabilitating at home. Bone fusion may take several months. When the surgeon is absolutely certain the bones have fused together, patients are able to discontinue using the neck brace or halo vest. 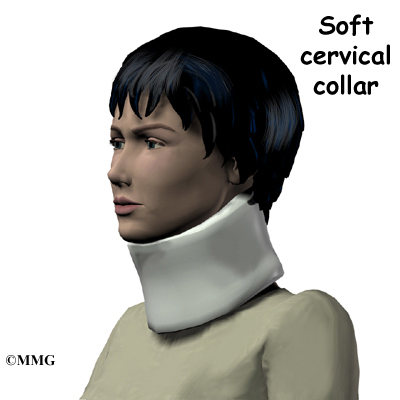 After being in a rigid neck brace for four to six months, patients are often weak and deconditioned. They sometimes need the help of a physical therapist to work on neck movement, strength, and general conditioning. As therapy sessions come to an end, the therapist may help patients with decisions about getting back to work.